Human CD58, Fc Tag (LF3-H5256) is expressed from human 293 cells (HEK293). It contains AA Phe 29 - Arg 215 (Accession # AAH05930). The protein has a calculated MW of 48.1 kDa. As a result of differtent glycosylation, the protein migrates as 60-75 kDa under reducing (R) condition, and 125-150 kDa under non-reducing (NR) condition (SDS-PAGE). 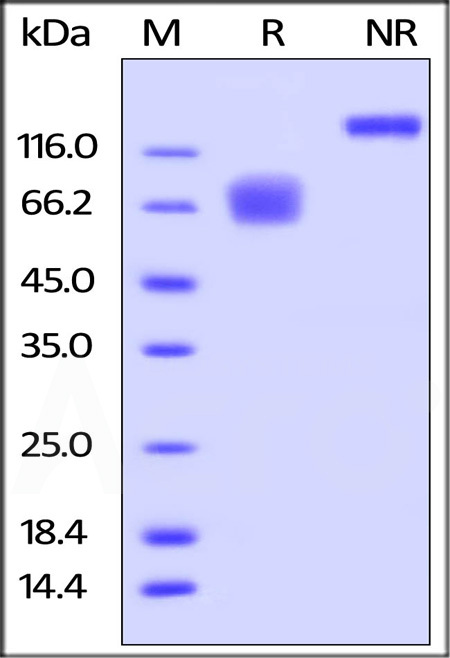 Human CD58, Fc Tag on SDS-PAGE under reducing (R) and non-reducing (NR) conditions. The gel was stained overnight with Coomassie Blue. The purity of the protein is greater than 95%. Immobilized Human CD2, His Tag (Cat. No. 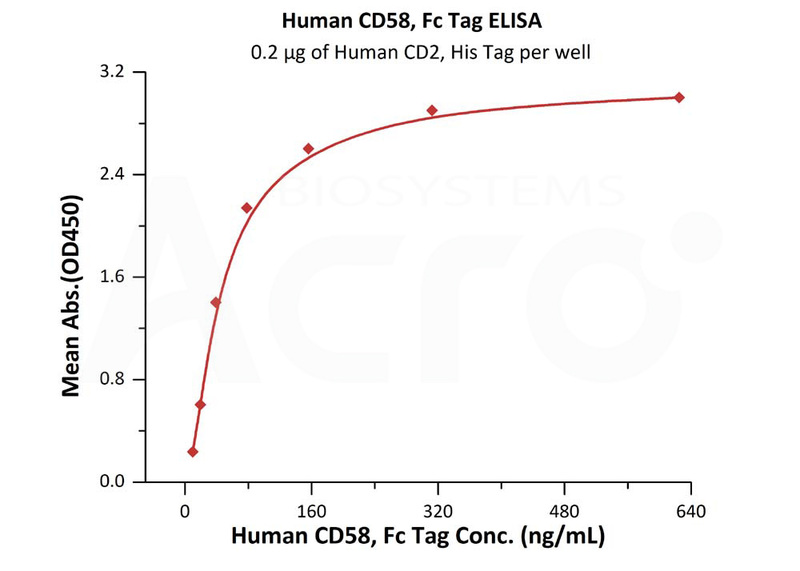 CD2-H5226) at 2μg/mL (100 μL/well) can bind Human CD58, Fc Tag (Cat. No. LF3-H5256) with a linear range of 10-156 ng/mL (QC tested). (1) Barbosa JA., et al., 1986, J. Immunol. 136 (8): 3085–91. (2) Wang JH., et al., 1999, Cell 97 (6): 791–803. (3) De Jager PL., et al., 2009, Proc Natl Acad Sci U S A. 106 (13): 5264–9.